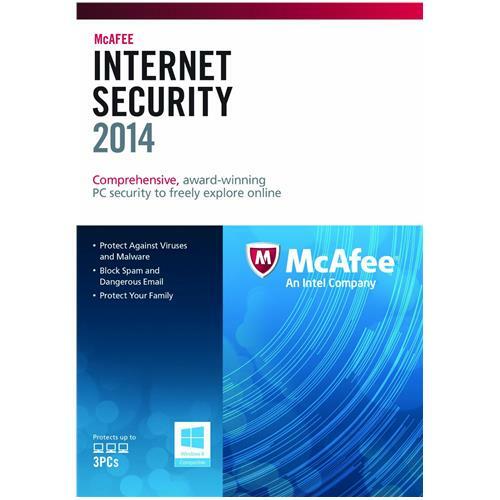 McAfee Internet Security 2014 1 Year 3 User PC + FREE Upgrade to 2015! Order within 1day 20hrs 7mins for delivery Tuesday 23 April using next day delivery at checkout. McAfee Internet Security offers comprehensive security to help you surf safely. Stay safe from Trojans, viruses, spyware, rootkits, and more, with state-of-the-art anti-malware protection. Stop worrying about performance hits - the advanced scanning engine checks for threats quickly without compromising battery performance. Keep zero-day threats and botnets at bay - McAfee ActiveProtection and NetGuard technology have you covered. PLEASE NOTE THIS PRODUCT IS FOR THE ACTIVATION CODE ONLY. PLEASE EMAIL US IF YOU WOULD LIKE THE CODE SENDING VIA EMAIL OTHERWISE IT WILL BE POSTED. YOU WILL NEED TO CREATE A MCAFEE ACCOUNT TO DOWNLOAD THE SOFWARE. Make sure dangerous and annoying emails never make it into your inbox with McAfee's most accurate filter yet. Block inappropriate sites and set time limits for Internet use. Check user login times, attempts to access forbidden sites, and total time spent online. See what your kids have been up to online with a detailed usage report. Find and patch holes in Windows and applications with McAfee Vulnerability Scanner.